WASHINGTON — House Republicans, in a determined but subdued manner lacking the fiery rhetoric that helped propel Tea Party candidates into office in November, voted yesterday to repeal President Obama’s signature law overhauling the nation’s health care system. The vote was the first significant — although largely symbolic — victory for the newly empowered Republicans, but the eight hours of debate before the tally lacked the populist fireworks that for two years have punctuated the debate over health care. The shift reflected a more somber tone adopted by both parties following the shooting of Democratic Representative Gabrielle Giffords in Tucson this month. Even Representative Joe Wilson — the Republican from South Carolina who received national attention for shouting “You lie!’’ during President Obama’s address to Congress on health care in 2009 — was subdued in his remarks on the floor. 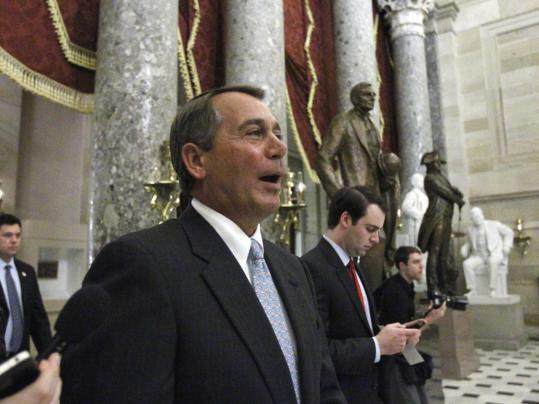 House Speaker John Boehner praised the “spirited but respectful’’ debate yesterday. Economists, health care analysts, and Massachusetts business groups largely dispute the notion that new rules will have a major impact on jobs. While Massachusetts businesses are seeking several changes to the health care law — chief among them a repeal of a new medical device tax — they say the law in the Bay State, which was a petri dish for the national plan, did not cost jobs. “I don’t think anybody has suggested that that had any impact on employment in Massachusetts,’’ said Richard Lord, president of the Associated Industries of Massachusetts. Jonathan Gruber, an MIT economist who was an adviser on the Massachusetts and the national health care plans, said some businesses would be likely to see cost increases as a result of the health care law, and that could result in lower wages for workers. But other industries would grow, particularly the health care field, once more people have health insurance. The 245-to-189 vote, which included three Democrats joining all 242 Republicans, helped fulfill an election promise that many Republicans backed by the Tea Party movement made during the midterm elections. The Democrats who voted for the repeal were Mike McIntyre of North Carolina; Dan Boren of Oklahoma; and Mike Ross of Arkansas. The 10 members of the all-Democrat Massachusetts delegation, including Stephen Lynch of South Boston, voted against the repeal measure. Lynch was the only member to vote against the bill when it was approved last spring. Passage of the repeal yesterday was largely symbolic because the Senate, still controlled by Democrats, is highly unlikely to consider the measure. Obama also would veto a repeal. Representative Edward J. Markey, a Malden Democrat, spoke out against repeal and held up a giant poster of two Lexington, Mass., parents holding a newborn. The woman, Markey said, had been denied coverage while she was pregnant because her husband switched jobs and the new plan said her pregnancy was a preexisting condition. Several times during the debate, Democrats invoked the name of Mitt Romney, the Republican and former Massachusetts governor who helped pass the Bay State’s landmark 2006 health care law. Romney’s advocacy of that law is seen as one of his chief hurdles in his expected presidential bid. One of the chief Republican talking points yesterday — that the health care law will destroy jobs by imposing penalties on small businesses that don’t offer health insurance to their employers — does not appear to be borne out by the experience in the Bay State. In Massachusetts, businesses with more than 10 employees have to pay a $295 annual fee if they do not provide insurance for their workers. The federal law has a $2,000 fee for businesses with more than 50 employees. Massachusetts businesses have been seeking several other changes to the federal law, including stripping a new 2.3 percent tax on medical devices and changing new tax reporting requirements that Democrats now concede may be too cumbersome for businesses. An August 2010 report from the Congressional Budget Office predicted that fewer people would be working as a result of the health care bill — roughly 0.5 percent of the workforce — but not because they would lose their jobs. Rather, the report says, allowing easier access to health care would enable people to work less or retire earlier than they do now for two reasons: prohibiting insurers from denying coverage because of preexisting conditions would increase the appeal of private plans outside the workplace for older Americans; and increased subsidies would put more money in workers’ pockets. Republicans are planning to keep the health care debate alive over the next election cycle, hoping it will lead to the ouster of Obama and a majority in the Senate. In the meantime, Republicans have started looking for an alternative course, scheduling hearings to grapple with reforming the medical malpractice insurance system and trying to repeal some specific provisions, such as a new tax on medical devices. Democrats appear willing to make changes — but remained opposed to a wholesale repeal. Republicans are also laying plans to eliminate or reduce funding for certain agencies that will be in charge of enacting the new law.